He might have decided he’d had enough at the end of Soft Machine’s gig opening for Jimi Hendrix across North America, taken the guitar Hendrix gave him and headed for the shores of the Mediterranean but the regular demands of the record business seem to have kicked in after Ayers released Joy of a Toy in 1969. An album on the market, it seems, demands a tour to support it, which in turn demands a band, and the result was an ensemble dubbed The Whole World. A British tour and another batch of material ready to go tends to point towards another album and that, in turn, suggests the retiree is back on the treadmill. Or not, as the case may be, because the outfit Ayers assembled wasn’t your common or garden rock’n’roll hits the road band playing your common or garden rock or pop. Ayers had leanings toward the avant garde, so it shouldn’t come as a surprise to find someone like free improvisation saxophone specialist Lol Coxhill in the line up, along with teenage prodigy Mike Oldfield, who could switch between guitar and bass depending on what Ayers was turning his attention to. Keyboard player and arranger David Bedford remained on board from Joy of a Toy, Mick Fincher alternated with Robert Wyatt behind the skins and folk singer Bridget St. John added an extra dimension to the vocals. Coxhill, born as far back as 1932, had a few years on the rest of them, and in between busking in informal settings had toured US airbases jazz outfits and backed visiting American artists including Rufus Thomas, Mose Allison, Otis Spann, and Champion Jack Dupree. He’d also worked with Canterbury scene bands Carol Grimes and Delivery, which later evolved into Hatfield & The North and was, more than likely, the collaboration that brought him into the Ayers orbit. 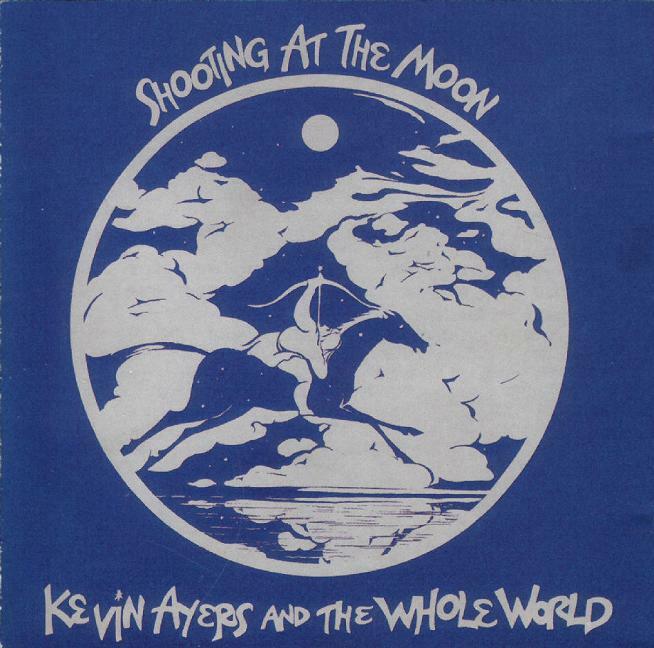 After the tour, when the outfit retired to the studio in October 1970 Ayers for the sessions that resulted in Shooting at the Moon the proceedings, unsurprisingly, produced an odd amalgam of sunsoaked balladry and avant garde experimentation. Equally unsurprisingly, the outfit had splintered by the time Ayers was ready to record his third solo album (Whatevershebringswesing) though most of those involved turned up on one or more of the sessions. Outfits led by people with a propensity to disappear towards the sunny Mediterranean would, one suspects, be odds on candidates for a relatively early demise. Given the players with whom he was collaborating, and Ayers’ own avant garde background the experimental and improvisational side of Shooting hardly comes as a surprise. With Soft Machine he’d spent the summer of 1967 touring France, performing at psychedelic events along the Cote d’Azur with a three week residency playing daily musical transmissions hallucinatoires, hired by Jean Jacques Lebel to be the second half of his Festival de la Libre Expression outside Saint-Tropez. Picasso’s play Le Désir Attrapé par la Queue (Desire Caught by the Tail) had been the first half. Equally unsurprising is the warm Mediterranean carefree ballad style that runs through the album from the opening May I? (reprised in French towards the end as Puis Je?). Rheinhardt & Geraldine/Colores Para Delores heads off into experimental territory, particularly on the instrumental cut up collage in the middle. There’s a more conventional (or as close to conventional as we’re likely to get) heavyish rock approach to Lunatics Lament that runs amok towards the end. The experimental side of things is back to the fore on Pisser Dans un Violon while The Oyster and the Flying Fish comes across as a rather pleasant folky duet with Bridget Saint John. It’s a rather pleasant little ditty that adds a bit of light and shade to the albums proggy and experimental overtones, which are back in the foreground on the atmospheric Underwater, a four minute instrumental that leads into the cheerfully sunny ballad Clarence in Wonderland. Red Green and You Blue inhabits a neighbouring postcode, with the Ayers croon in the forefront, then it’s back into Soft Machine territory for Shooting at the Moon (a reworking of the Softs' Jet Propelled Photograph). The sunny balladry kicks off Butterfly Dance, which turns up-tempo and heads off into avant garde territory around the fifty-second mark, while Puis Je? as previously noted, is May I? rendered in French. As far as bonus tracks go in The Harvest Years 1969-1974 incarnation of Shooting there’s a trio of titles labelled Alan Black Session, apparently recorded for Radio One (Gemini Child, Lady Rachel and Shooting At the Moon) and another from 9 June 1970, recorded for John Peel’s Top Gear (Derby Day, Interview and We Did It Again / Murder in the Air). Looked at as a whole Shooting is a solid record, though the listener’s enjoyment is going to depend pretty directly on his or her inclinations when it comes to progressive, arty rock. Take the experimental elements out and what’s left comes across as a collection of sunny ditties that bop along rather happily (Clarence in Wonderland being the best example), carefree but not exactly lightweight, add them back in and you’re looking at the sort of avant-garde fusion the average listener might well be happy to go without. Overall, I think, one to approach with caution though there’s definitely something of interest to be found.